Create custom note templates with individual fields and dynamic templates. Insert fields to default data anywhere in a note. Automatically add diagnosis, billing codes, lab orders, and prescriptions with a click of a button. Templates can have custom section names. Templates field can be pull down fields, check boxes, text entry, or Boolean. Macros can be used to insert text or fields on demand. Templates can display tables of data. Surveys can calculate scores and interpret results. Information can be pulled from prior visit to reduce redundant data entry. 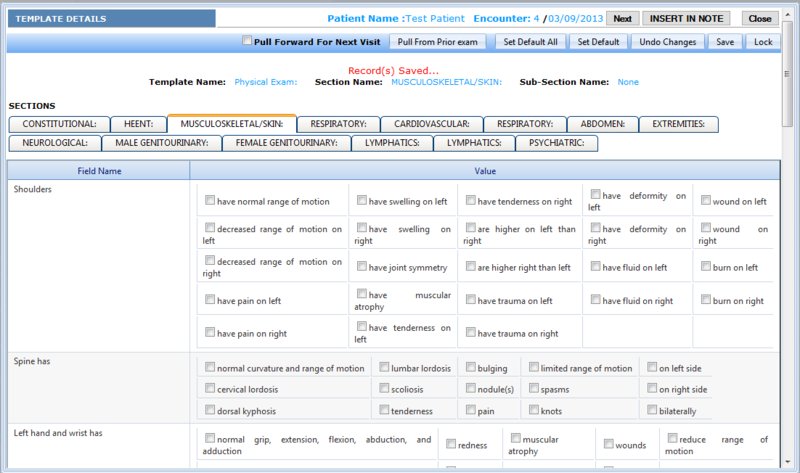 Chief complaint templates build sentences describing the patient to comply with proper clinical documentation. Fields can be conditionally linked together. All data are stored in Database and made available. Colored check marks appear next to each template name on the menu to indicate if a template has been worked on or finalized.